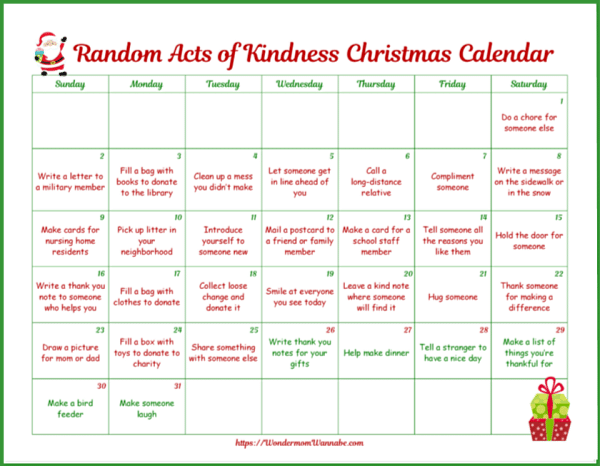 This Random Acts of Kindness Christmas Calendar for Kids is a wonderful advent activity for kids! It’s a fun and easy way to show children what a positive impact they can have on the world. Three years ago a random acts of kindness Christmas calendar showed up in my Facebook news feed. 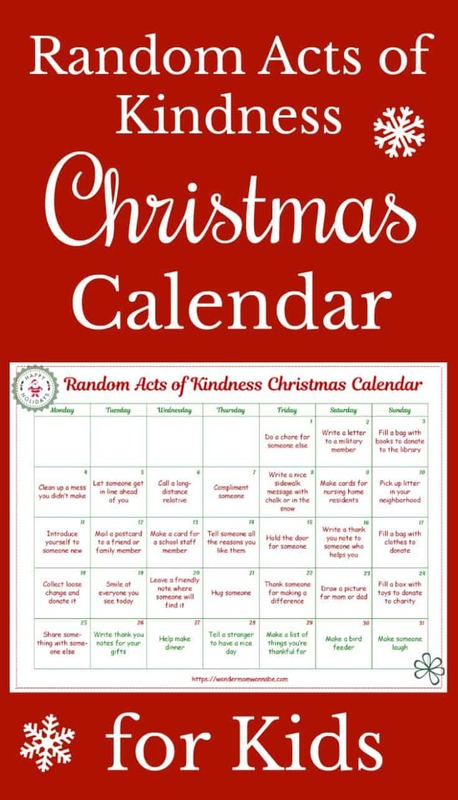 I really liked the idea of doing something kind each day leading up to Christmas. I also thought this was a wonderful way to help instill the spirit of the season in my family. I didn’t want my kids to think Christmas is all about collecting toys. Even when we do exchange gifts, we try to choose gifts that give back to others in some way. The random acts of kindness Christmas calendar from Coffee Cups and Crayons was a fun one to do as a family. Unfortunately, most of the acts required adult participation. That, of course, was what made it perfect for the whole family. But I wanted to create one that kids could do on their own to emphasize that each of us (no matter how small) can make a difference. Just click on the links above to jump directly to a specific item. 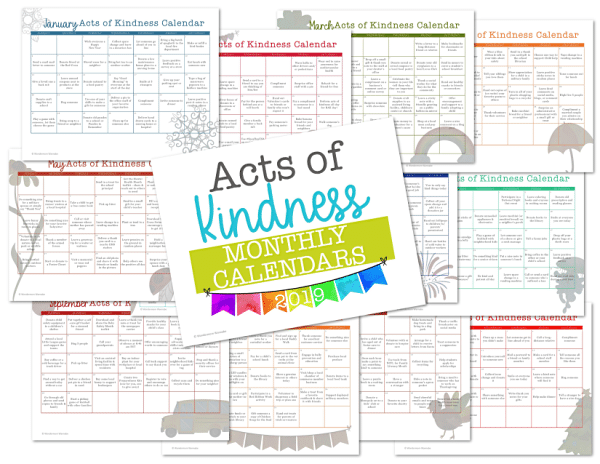 Get an entire YEAR’s worth of Kindness Calendars. Click the image below to read more. For my Christmas calendar, I only included acts that school-aged children could do without help. An adult might have to step in to act as delivery driver or provide a stamp, but that’s it. The reason I recommend the calendar for school-aged children (and not younger) is due to the number of acts that require writing. If you have an early writer, he or she can certainly perform all of the tasks. You can also have your child draw pictures instead of writing notes and letters. To download the Random Acts of Kindness Christmas Calendar for Kids, simply click on the image below. To send letters to our service members, consult this list. To donate gently used toys, consider these options. To donate gently used clothes, try one of these charities. I created the calendar above to provide you and your children with some ideas to make performing acts of kindness easier. I’m sure you have many wonderful ideas of your own! 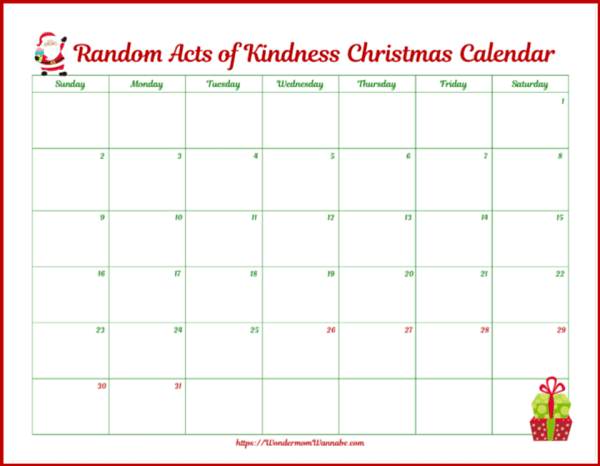 I’ve created a blank random acts of kindness Christmas calendar so that you can fill in your own acts of kindness. Another way to use the blank calendar is to have your child write in a random act of kindness they perform each day. The kindness calendar above was designed specifically for the kids. This year, I wanted to introduce an advent activity for the whole family too. So, I created these Family Activity Advent Cards. There are 60 activities to choose from so you can easily find 25 your family will enjoy. 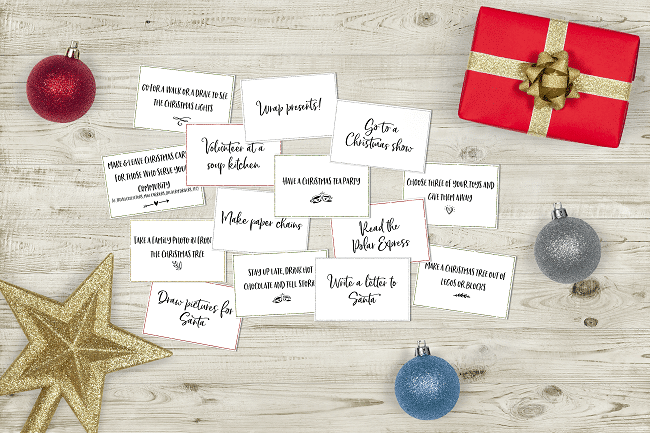 But just in case, there are also some blank cards so you can fill in your own ideas. Think of it as a Christmas bucket list advent activity. I also really love the book Countdown to Christmas. 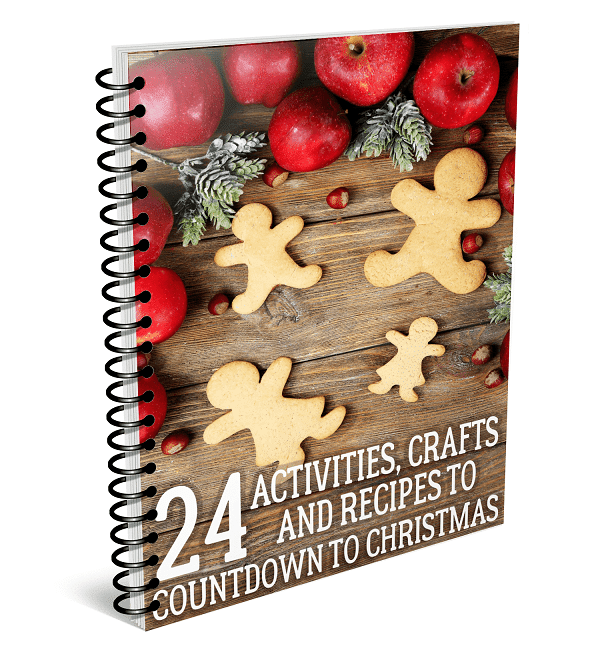 It’s filled with 24 different activities, crafts and recipes so you can do something new each day that also helps you make memories. I thought that was a great idea! So, for those of you who would like to use the calendar in that way, I’ve created a sheet of the Random Acts of Kindness Ideas for Kids (without the dates in the corner) so you can cut them up and choose them randomly. Then, after you’ve drawn the random act of kindness for the day, you can glue or tape it to the blank calendar. Of course, you can ditch the calendar completely! 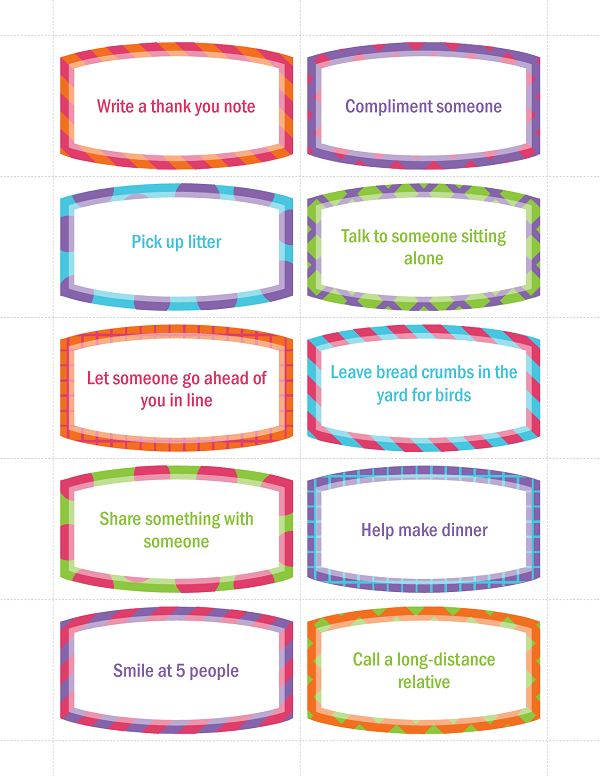 Instead of the plain idea squares, you might prefer these random acts of kindness cards for kids. 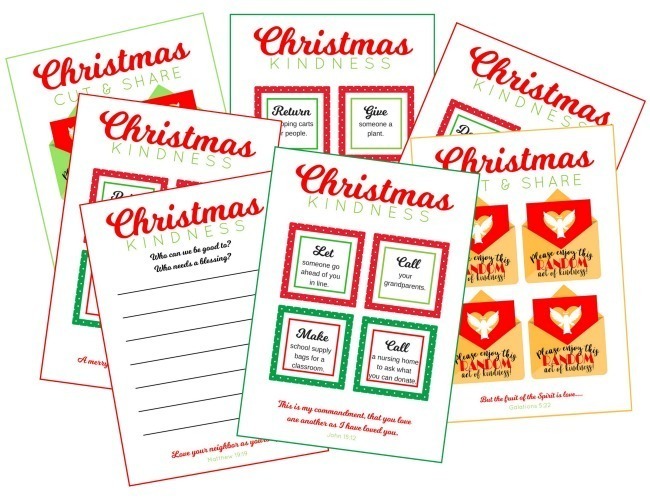 For my fellow planner addicts, I even have a Christmas Kindness Planner. Join my email list to get it for free! Surprise your children with your own random acts of kindness towards them with printable kid coupons or printable lunch notes. Since the notion of random acts of kindness is to do something good for someone else without expecting anything in return, don’t use these as “rewards” per se, but as occasional treats to show children that good begets good. 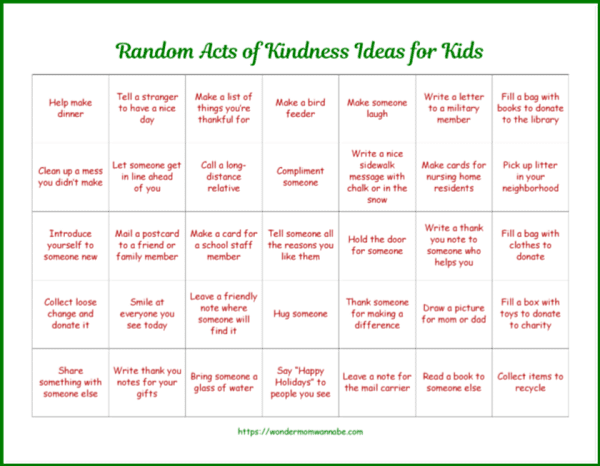 If you’re looking for even more random acts of kindness ideas, check out my Random Acts of Kindness Ideas page where I have hundreds of ideas! As an alternative to Elf on the Shelf, check out Kindness Elves. Instead of being mischievous, they sprinkle kindness and joy, encouraging children to do small acts of kindness every day. Aloha! I love this idea and would like to edit the calendar so I don’t have to hand write the deeds. I tried clicking on the editable calendar and it did not download. Any advice? Hi Carolina, sorry about that. Unfortunately, I wasn’t able to convert this year’s calendar so I removed the editable version. I didn’t realize that I still had the menu link up above that used to jump to the section where it was located in the post. I believe that’s the link you were clicking. I’ve removed the link so as not to confuse others. Because of how the dates fall this year, the calendar is larger than usual to accommodate an extra week and it messes up the formatting when I try to move it to an editable Word document. I love this! I printed it last year but never got around to planning soon enough to use it. I’m ahead of the game this year and am prepping for this year’s festivities now. Did you make one of these for 2017? I would love to print it and do it! This is the 2017 version. I’ll double check and make sure I changed all the links though! Just double checked. They are leading to the right download. Are you having trouble pulling up this year’s calendar when you click the link or image? Good ideas! Yesterday my kids filled a stocking with cat and dog toys/treats and we took it to the local animal shelter. Thank you for the Random Acts Christmas Calendar. I just printed it. I’m cutting out the days and placing them in our advent calendar! What a great idea! I hope your family enjoys this tradition! I need to know how to print the blank calendar. Also, is there a way to insert the acts on the calendar I make before printing. Thank you. Hi Patricia, to print the blank calendar, you just have to click on the picture of it in the post. It should open the file in a new tab. You should see a small printer icon in the upper right-hand portion of the screen. If you want to type your own acts onto the calendar before you print it, you will need a program that lets you edit PDF files or you will need to save the file as an image and use an image editor to add text to each box. I love the idea of a calendar of activities that kids can do independently! Thanks! This is an amazing idea! I’m also going to use this idea at work for team building. Thanks so much! That’s a great team building idea! Definitely check out the other articles and my Pinterest board. There are a lot of different suggestions from other sites with plenty of other kindness act ideas that might work well in that environment. Wonderful social learning tool! Schools should take note of this and send it home with students to encourage parent support. I’m proud that my youngest son is a gentleman and has this behavior year round. It’s a joy to go to a store or another community place where he races ahead to hold the door open for all of us entering. Including strangers ahead of us. He helps guide new students at his school and walks the kindergarten children to their classes.Today he brought in two bags for the Thanksgiving food drive. These things make a difference in society. I hope your calendar spreads the acts of kindness further when we need it most. That is wonderful that you have raised such a kind and thoughtful son! It warms my heart to see so many people sharing this post. The calendar might only cover a few weeks, but the hope is that it helps start a year-round trend of being kind to others. Thanks so much for your comment. This is a great idea. Thank you for sharing. I am going to see if my daughter’s teacher is up for this and will do at home as much as I can with a 3 and 5 year old. Oh Kat, that’s a great idea! I’ve had several new subscribers write and let me know they are grandparents. I’m sure you’re not the only one who would enjoy it. These are fantastic, Thank You!! My kids are grown now, but I am sharing with all my friends and plan on making my own ‘grown up’ random acts calendar to do myself. I love it. I have five boys that are learning to give with out expecting something in return. I’m so glad. Your boys (congrats on a whole home full of them!) are fortunate to have a mom who is helping them grow up with great character. Have a wonderful week. All the information is wonderful. I love your ideas. Thank you for sharing all this with us. Thank YOU for taking the time to comment! So happy you like the calendar! These are great!! Love them! Thank you Susan. It was my pleasure. There are so many good ideas in your post! I was wondering the same thing, but I do have an idea to solve that. Write down the things you could do on slips of paper, put them in a jar, and each morning draw one out to complete that day. That night, write what you did on the calendar. Also a great time to talk about how both you and the recipient reacted. I love the. Calendar, but I can’t see the link to the blank one. Can you please post it. I really appreciate you offering this. I was going to print these out but there is a bright orange banner right in the middle of the top on most of these. I hate being forced to donate I have my own charities, thank you very. Hi Sherry, I’m sorry you are having trouble! All of these printables are 100% free of any obligation. I think one of my ad providers must be inserting an ad if you are seeing a banner over them. I’m going to try and figure out which one, but for now I am e-mailing you the files so that you have them. Sorry for the inconvenience. I think I found the culprit and removed it. I did send the files to your e-mail too, just in case. Again, sorry for the inconvenience and thank you for letting me know!